Keith A. Crandall and James W. Fetzner, Jr.
Ref: Hobbs, H. H., Jr. 1974, 1988. Freshwater crayfishes are taxonomically distributed among three families; two Northern Hemisphere families, Astacidae and Cambaridae and one Southern Hemisphere family, Parastacidae. There are two centers of species diversity for freshwater crayfishes. The first is located in the Southeastern United States where some 80% of the cambarid species can be found. The second center of diversity is in Victoria, Australia; housing a large proportion of the parastacid species. Freshwater crayfishes naturally occur on all of the continents except Africa (Figure 1). The Astacidae are distributed West of the Rocky Mountains in the Northwest United States into British Columbia, Canada and in Europe. The Cambaridae are found in the Eastern United States and south through Mexico. The Parastacidae are distributed in Australia, New Zealand, South America, and Madagascar. Figure 1. World distributions of the three crayfish families. The phylogenetic relationships among the freshwater crayfish families and their relationships to lobster-like ancestors has been of considerable debate for at least 100 years. Two alternative hypotheses have been proposed for the origins of crayfishes. The first supposes a diphyletic origin of astacoids and parastacoids suggesting independent invasion of the freshwater habitat (Huxley, 1880). This idea is supported by the two centers of diversity in the northern and southern hemispheres and by a number of morphological features (Hobbs, 1974). However, Ortmann (1902) argued for a monophyletic origin of the crayfishes. This position has recently been supported by sperm ultrastructure characteristics (Jamieson, 1991) and by embryonic characters (Scholtz, 1993). Because of this ongoing debate, the positioning of Parastacidae is shown as unresolved. Crandall, Keith A., D. James Harris, James W. Fetzner, Jr. 2000. The Monophyletic Origin of Freshwater Crayfish Estimated from Nuclear and Mitochondrial DNA sequences. Proc. R. Soc. Lond. B (2000) 267, 1679-1686. Hobbs, H.H., Jr. 1974. Synopsis of the families and genera of crayfishes (Crustacea: Decapoda). Smithsonian Contributions to Zoology 164:1-32. Hobbs, H.H., Jr. 1988. 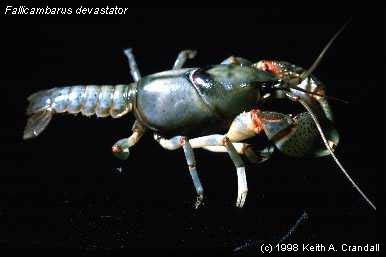 Crayfish distribution, adaptive radiation and evolution. Pp. 52-82 in D.M. Holdich and R.S. Lowery (eds), Freshwater crayfish: biology, management and exploitation. Timber	Press, Portland. Huxley, T.H. 1880. The crayfish: An introduction to the study of Zoology. D. Appleton, New York. Jamieson, B.G.M. 1991. Ultrastructure and phylogeny of crustacean spermatozoa. Memoirs of the Queensland Museum 31:109-142. Ortmann, A.E. 1902. The geographical distribution of freshwater decapods and its bearing upon ancient geography. Proceedings of the American Philosophical Society 41:267-400. Scholtz, G. 1993. Teloblasts in decapod embryos: an embryonic character reveals the monophyletic origin of freshwater crayfishes (Crustacea, Decapoda). Zool. Anz. 230:s45-54. Scholtz, G. 1998. Von Zellen und Kontinenten-die Evolution der Flu?krebse (Decapoda, Astacidae). Neue Folge Nr. 137, 205-212. Scholtz, G. & Richter S. 1995. Phylogenetic systematics of the reptantian Decapoda (Crustacea, Malacostraca). Zool. F. Linn. Soc. 113, 289-328. Scholtz, V. G. 1995 Ursprung und Evolution der Flu?krebse (Crustacea, Astacida). Sitzungsberichte Gesellschaft Naturforschender Freunde Berlin 34, 93-115. Crayfish. An Introduction to the Study of Zoology. By T. H. Huxley, F.R.S.